PFP Systems is our performance fueling platform. A compliant, patented and innovatively-designed portable system, it has been purchased by businesses that are striving to be proactive in their emergency preparedness programs. Additionally, various industries in non-emergency capacities have used them as a fuel source where compliancy and portability is a necessity. The conception and development of the PFP arose due to compliance issues in the current portable fuel supply arena. Many suppliers claim their products are compliant but further scrutiny may expose irregularities or absence of complete compliancy. We have left no stone unturned in our quest for complete compliancy with the PFP system. Our tanks are designed to store petroleum products including gasoline, diesel, jet fuel, oils, and other related products such as ethanol, and methanol. No rainwater management needed. 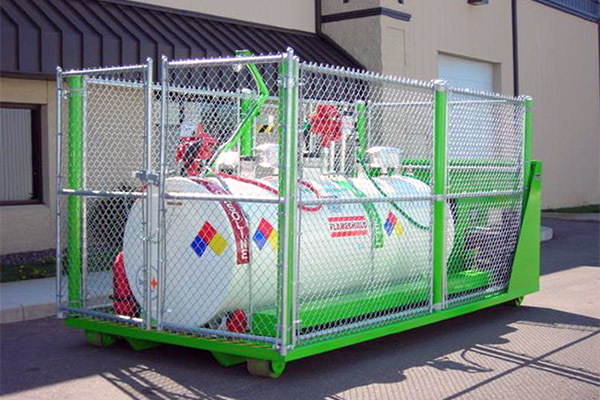 Comparatively, tub-style secondary containment is required for other portable tanks. Performance Petroleum is the sole distributor of the patented and innovatively-designed PFP System.